I have Bermuda grass in my yard and it is getting into my garden beds. NOTHING I have tried has worked to get rid of it. What do you suggest?. This question is close to my heart. I bought a house a couple of years ago, and the yard is filled—FILLED—with Bermuda grass that the former owner must have purposely seeded into the lawn. For me, Bermuda grass presents a mind-boggling obstacle to pleasurable gardening. Bermuda grass laughs at your thorough weeding job and respects no boundaries. It quickly and ceaselessly overtakes your garden beds without any regard for your prospective harvest. 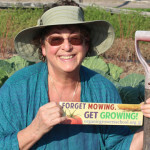 Once you have planted, it is nearly impossible to weed it out without destroying your veggies and flowers. Although Bermuda grass (Cynodon dactylon) is considered an excellent pasture grass, it is a gardener’s nightmare. 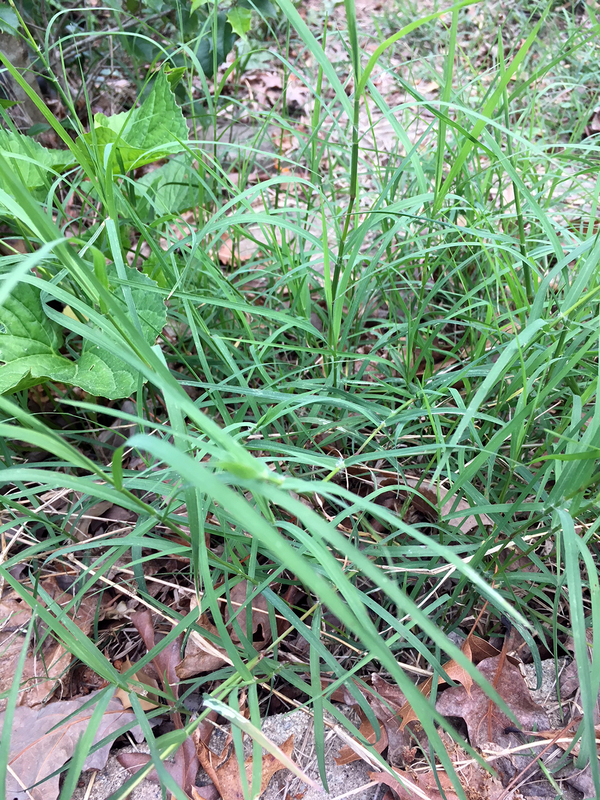 This highly invasive grass originated in Africa and is prevalent in the southeastern and southwestern USA. Bermuda grass is also called wiregrass, couch grass, and devil’s grass (very appropriate nickname!) It reproduces in three ways—by seed, by above-ground vine-like shoots (stolons), and by below-ground shoots (rhizomes). Seeds remain viable in the ground for a couple of years. It is extremely difficult to kill even with multiple applications of strong herbicides. Adjectives in my research described Bermuda grass as evil and tenacious with roots that “go to China.” Texas garden designer Liz Klein likened it to “tiny running bamboo.” It is very devious and sneaks its way into your yard by growing in difficult-to-reach spots—alongside the foundation of your house, mixed into the iris bulbs, and along rock borders. It rebounds at an astonishing rate, and grows straight across your paved driveway without missing a beat. 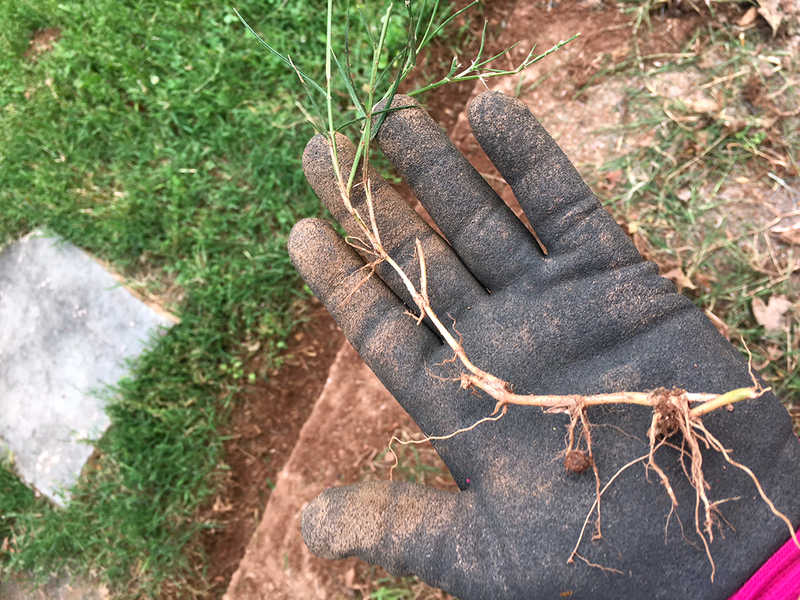 I have re-weeded areas multiple times, digging down as deep as I could looking for rhizomes, and the grass returned and spread like wildfire, even growing vertically into small shrubs. 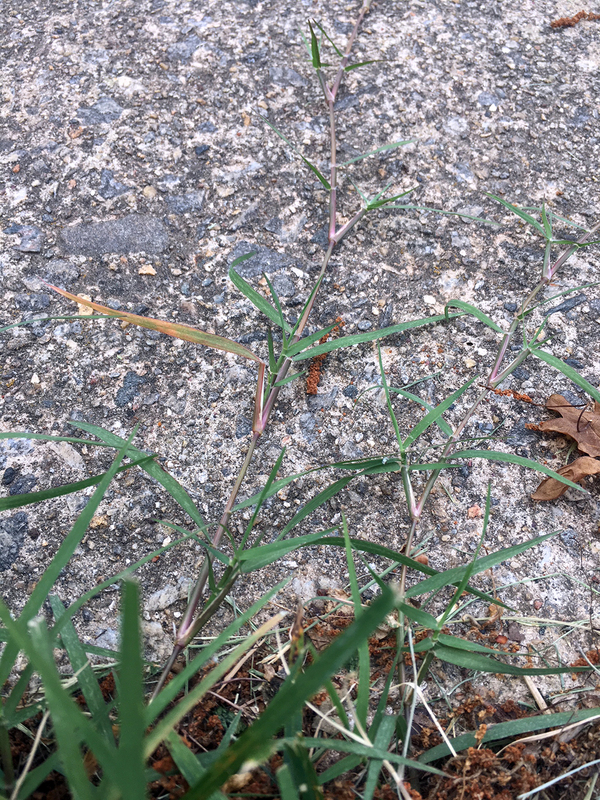 I have edged my driveway to find 3-foot-long stolons leaping across the pavement 30 days later. Bermuda grass stolons growing over pavement. Prevent the grass from achieving photosynthesis by covering it with a barrier. Plain mulch is not adequate to suppress Bermuda grass. In my yard, I used sheet mulching effectively with the long-term plan of doing my entire yard over time. Mow or (better yet) weed-eat the grass area as low as possible, ideally to the ground. Then rake up and remove any grass/rhizomes/stolons. Lay down a half-inch layer of compost over the entire area. This will stimulate biological activity. Flatten cardboard boxes and leave them together so they will be two layers thick. Appliance boxes are ideal. Lay cardboard over the entire area, overlapping box edges at least 6 inches so there is no place for grass to grow through. Secure cardboard with a generous number of Sod Staples to help prevent grass penetration. Thoroughly wet cardboard all the way through—this is important. Cover area with 3 inches of mulch. Do NOT allow Bermuda grass to grow on top of mulch. Weed-eat it back. Do NOT cut holes in cardboard for planting as that will be a spot that the Bermuda grass could take hold. If a seedling pops up weed it out quickly. Allow 4–6 months or more before disturbing the area. In already planted areas, consider removing the existing plants to a temporary bed during this process. Otherwise it is likely that Bermuda grass will thrive at the base of the existing plants and re-invade your garden bed. Bermuda grass in garden bed. Be extremely vigilant. Learn what Bermuda grass looks like, and do not import any plant material into your yard that contains even a hint of Bermuda grass. It’s not worth it. Edge and weed-eat regularly to keep the Bermuda grass confined to the lawn and OUT of your garden beds. If the grass is not yet in your beds, this can be a very effective remedy if done religiously. Do not rototill the area. You will break the rhizomes up into small pieces that will create more plants. One application of RoundUp (or other herbicide) + ground cloth is not considered a viable long-term solution. Vinegar-based sprays and organic herbicides like BurnOut may temporarily suppress Bermuda grass. If you already have Bermuda grass, be aware that eradication is an ongoing and probably a multi-year challenge (Matt Martin, using a very strong herbicide, considered it a 3–4 year endeavor). YouTube gardener EcoTechnify found old carpet very useful for suppressing Bermuda grass. He lifted the edges twice a year to keep the grass from growing over the top. During the heat of summer when the grass is most actively growing, solarize the area using UV clear plastic adding 2 feet to the area on all sides for good measure. Allow 6 weeks to work. When digging out Bermuda grass rhizomes, gardener David Stillwell put the soil through a screen to capture smaller rhizomes. Do NOT add any part of Bermuda grass to your compost pile or leave it in your yard. It needs zero encouragement to re-take your yard. Manures should be composted to the proper heat to kill any Bermuda grass seeds before applying to your garden. Check out University of California’s Integrated Pest Management Information. Readers, if you have a solution that has proved effective for a minimum of one year, please share! And Joan, I sincerely wish you great success with this job. When I moved to my place 12 years ago one of my neighbors told me that my place had been worked hard by a previous owner…. lots of inputs and lots of yield. He said, “ only problem is that girl, you have yourself some Bermuda”. After years of regeneration, I still have some Bermuda… major amounts. All that weeding, all that digging, all that burning, all that feeding to goats…. has not seemed to make much of an overall dent. The only beat back that I have found is to do the heavy cardboard layers that extend beyond the perimeters of a planned raised bed, build the raised bed, fill with soil that has been made in the compost/chicken yard, mulch HEAVILY around the perimeter of the bed…extending over the layer of cardboard and then pull all the runners that seem to “come up for air” around the cardboard. Any plantings that are out in the open and not in beds are just frequently weeded with the abandonment of any idea of ultimate completion of the task. I have heard of and plan to try at some point the concept of digging a 6 inch wide trench around landscape beds and filling the trench with gravel. Then, plant within the trenched area. Has anyone tried this? Best of luck to us all. On a positive note, the rhizomes seem to make a very effective treatment for kidney stones when dried and made in to tea. Ruth, great article, I recognize your passion on this subject. I’ve spent more of my energies fighting another garden invader, mugwort, but I have Bermuda grass in the lawn and am engaged in an ongoing battle at the borders. I actually find it emotionally therapeutic when I’m stressed out to dig Bermuda grass roots after rain and the ground has been softened so I can go deep. When I wish to convert another patch of lawn to garden, I’ve had success overlapping, by a foot or so, large scraps of metal roofing remaining from my last roof job some years ago, leaving them in place 3-6 months, held in place by stones. It is important not to walk on them when it rains, as they get very slippery, and the edges are crazy sharp and must be handled with tough gloves. I’m also careful to anchor them down sufficiently during and between uses to keep them from blowing in big winds. On a farm scale till or disc multiple times in spring over a one month period preferably during a drought or period of little rain when the bermudagrass normally emerges. Final tillage should be shallow and done as soon as the soil is barely dry enough to do the tillage after a rain. Then plant a cover crop of sudex and cowpeas into moisture at a high rate. Mow the cover crop to 12” every time it reaches 4’ all through summer. Mow to ground in September then till and plant a winter cover crop of ryegrass. Bermudagrass should be gone the next year. Hi Shawn! Love the idea. It is hard to imagine a cover crop of any kind out-competing Bermuda grass. May I inquire whether you yourself have accomplished this successfully on property you have lived on for at least 2 1/2 to 3 years after the “treatment”? Bermuda grass seeds are viable for 2 years in the ground. Also curious about the amount of Bermuda grass you were dealing with. Was it pasture planted in Bermuda grass? Hi Ellen! I like the idea of using metal roofing. That should have similar results as the cardboard or the carpet. I love that you find weeding Bermuda grass therapeutic. I wish I could have that attitude. For me it is the opposite of therapeutic. At the beginning I thought my thorough weeding job was sufficient. Nope. Just a temporary setback for mean ole Bermuda grass! It is in every part of my yard, and after re-weeding the same area multiple times without any permanent result, it puts a serious damper on my gardening plans. Key thoughts: Bermuda grass doesn’t like shade, it likes sunshine. So anything we can do to create shade ie. cardboard, carpet, Ellen’s metal roofing (see below) should be somewhat helpful. And I think you would have to raise the carpet every 1-2 weeks to keep the Bermuda grass from jumping across the carpet (not twice a season like he mentions in the video). Did the cover crop work? Would love to know as we have bought a house to rennovate where the “garden” is really three acreas of rough land and forgotten beds that has been left for decades. It is along a woodland edge (also ours), with farmland/ sheep either side. The garden/grassland has only ever been mown, (so no beds beds now…you can just find stones where a couple of flower beds once were). The scale means we often let some areas of grass grow to about six inches to a foot. The land is uneven, some sloping, bramble, lots of couch grass,creeping buttercup, loads of dock, thistle etc. (Also just to make life difficult some lovely primroses!) We would like to cultivate it/ design a garden, make some flower beds, veg and fuit gardn, but don’t feel we can start until we get rid of the field weeds. …they are so strong and fast growing, they would quickly gobble up anything we put in. Would a cover crop be a good way to start when working on this scale? Would you recommend pesticides….ie is it possible to do this organically? Any tips would be wonderful:-) We also get deer and ticks….so would like to dissuade those as well. Prepared to take the long, patient road if one day I can have a garden free of these pesky bullies! I have not personally tried cover-cropping as a way to squeeze out Bermuda grass (couch grass), but my gut instinct is that cover cropping by itself would not be successful (if others have accomplished this successfully, please speak up!). Bermuda grass is stronger than most cover crops and that is why one of its nicknames is Devil Grass. I think cover-cropping would be successful in areas that do not have Bermuda grass. I honestly feel that only a 8 week period of dolarization with 2 mm Uv clear plastic will eradicate the devil grass in my garden area. So I am doing that now between my raised beds and a 2 foot area all around. There will be no tilling just a good a good taking and cardboard layer down for new additional garden beds going in fall of 2018. But once solarized wondering if I can put down 20 year premium landscaped barrier fabric and landscape timbers and about 4 inches of pea gravel in between and around beds with landscape timbers holding it in, or will it be a constant spray kill scenario? I’m in Phoenix. I started my solarization with 2mm clear in June, an left it 3 months through the end of August. Plastic over the edges of the raise beds, draped down to the ground, held in place with logs & stones. Bermuda started to sprout again almost immediately after I removed the plastic and watered the soil. I’m thinking maybe next summer I’ll dig out a hollow in the middle of the garden beds, pack with dead wood and start a bonfire.